Global Frozen Bakery Market size was estimated over USD 30 billion in 2017 and the industry will grow by a CAGR of more than 5.0% up to 2024. 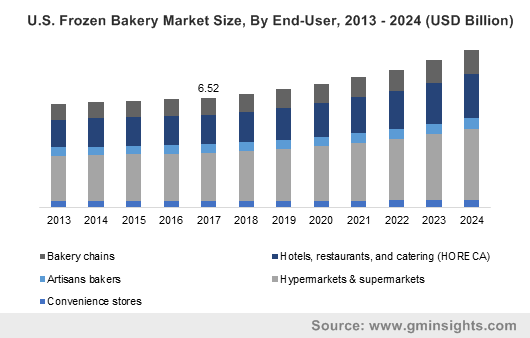 Frozen bakery market will register a noticeable growth during the forecast period. Increasing demand for processed food products coupled with shift in consumer preferences towards baked products is likely to augment the demand for frozen bakery products. These products can be stored for a longer duration of time as compared to the traditional bakery goods. Multiple benefits offered by these products such as ease in availability, better quality, longer shelf life, environmentally friendly manufacturing process, and reasonable pricing will drive the market in future. Changing lifestyle such as adopting healthier routines coupled with surge in number of working women will lead to rapid growth in consumer food service. Global packaged food consumption generated a revenue of around USD 2.5 trillion in 2017, of which baked goods account for close to 15% share. Rising number of retail outlets selling the product in the emerging economies coupled with attractive advertisements and marketing will also signify the demand for such luxury food items. The above-mentioned trends will boost the demand for frozen dough in developing nations as people have lesser time to spent in their kitchens. Mature conventional fresh baked products market and variation in the energy cost are the key restraining factors for frozen bakery market growth in coming years. High electricity prices resulted in high operational cost for frozen bakery products manufacturers as most of the products are perishable in nature and need to be kept at frozen conditions. This might be the reason that some of the manufacturers have installed their plants in neighboring countries where electricity tariff is low. These above-mentioned trends will hamper the overall market by 2024. Global frozen bakery market is bifurcated into different recipes which include savory snacks, bread, patisserie and viennoiserie. From these, viennoiserie & bread clutch over 70% of the entire volume share in 2017 and will grow at a substantial CAGR by 2024. Development in the fast food and ready-to-eat product chains like Dominos, Burger King, McDonald’s, Pizza Hut, etc. will strengthen the overall product market demand in future due to the extensive usage of bread by these companies for the production of pizza bases, buns, etc. This will further boost the frozen dough demand for bread production and will drive the global market in forecast period. On the basis of revenue, patisserie was valued at USD over 2.5 billion in 2017 and is likely to grow expand its market share over the forecast timeframe. The product mostly prepared from fresh or frozen dough and further consumed as a sweet dish. Patisserie is also used as wedding and designer cakes or as desserts in various ceremonies across the globe. Increasing consumption of the product in several occasions and festivals will further bolster the overall global frozen bakery market by 2024. Ready-to-prove product segment clutches around 15% of the volume share in 2017 and will show a substantial growth in coming years. Growth in quick serving restaurants will positively influence the segment demand as ready-to-prove products such as cakes, bread-based desserts, pastries, etc. are popularly served in these restaurants. Ready-to-bake segment held more than half of the entire volume share in 2017 and will significantly increase its market share in forecast period. This product segment comprises fermented frozen dough which are further used for preparation of cookies, pizza base, burger, etc. by baking. Increasing demand for fast foods will boost the entire frozen bakery market in coming years. Convenience stores plays a significant role in marketing & distribution of the product and captures over 15% of the entire end-user segment in 2017 and will show the significant growth in coming years. The ease of availability of the product and hectic lifestyle of people has led to the popularity of convenience stores such as Mom and Pops, SMU, Cup Cakes Factory, etc. Through such convenience stores, the manufactures have the advantage of showcasing their diverse product portfolio in a single platform. This in turn, will boost the global market growth in future. Hotels, restaurants, and catering end-user segment clutches more than 15% of the volume share in 2017 and will show a sluggish growth over the forecast timeframe. The segment includes the fast food chains as well as family restaurants and hotels that serve food which takes less time to cook resulting in minimal table time. Growth in global tourism industry will boost the entire segment demand and this will positively influence the frozen bakery market in forecast period. Germany led the Europe market in 2017, with a share of over 20% in 2017 and will likely expand its share by 2024. Surge in tourism & catering industry in European countries such as Germany, UK, Italy, etc. will offer a promising regional growth in coming years. The regional market is driven by growing demand for ‘bake-off’ and ‘thaw & serve’ products that provide ease to quick service restaurants, retail bakeries, and households. Additionally, increased shelf life of the product offers the advantage of stocking the goods for seasonal variations, which is common in Europe. In 2017, North America has revenue of more than USD 8 billion in global frozen bakery market and is expected to grow at a significant rate by 2024. U.S. & Canada will have a thriving market due to increased processed food requirement and changing consumer lifestyles. Moreover, the improved food culture & living standards along with the regional economic growth will augment the frozen bakery market in future. 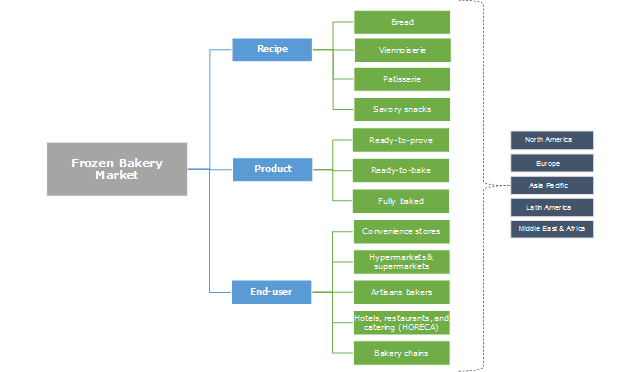 The frozen bakery market comprises of global players and few of them are Grupo Bimbo, Europastry, General Mills, Inc, Rich Products Corporation, Dawn Food Products, Vandemoortele, Aryzta, BredenMaster and others. Among these, Grupo Bimbo is a key manufacturer accounting for a significant share in the American market in 2017. The Mexico based company has been able to acquire leading market position in Latin America through a number of strategic steps taken over a long period of time. They have acquired Ideal S.A. food company which has more than 90 years of existence and pioneer in Chile in the manufacturing of packaged bread. Shift in consumer preference towards nutritious baking ingredients along with eye appealing products with enhanced shelf life & high quality has been leading the consumers to switch towards frozen bakery from traditional baked products. Growing capability of consumers to afford high-end food products with improved nutrition, and durability will influence the global frozen bakery market over the forecast span.